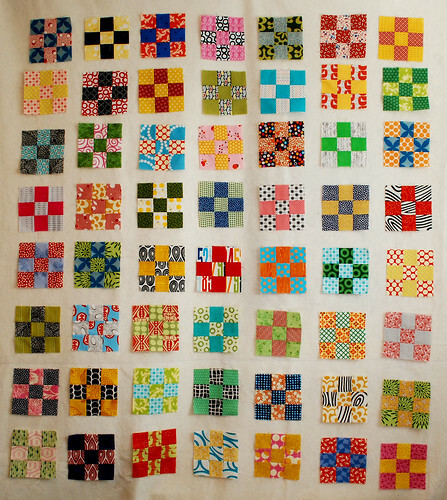 Oh nine patch quilt….you seemed to simple to make and yet you’ve given me such a bad headache. What to do with you? I think the best thing for me to do is to be content where I’m at now. I spent another day today making blocks, and I think I’ve been able to achieve a better balance of color and pattern with some of my original blocks. That’s a very good thing to me. There’s still something though that I can’t put my finger on that bugs me about it, but I can’t really figure it out. That’s why I’m going to call it good. At least, I think that’s the plan right now. We’ll see what happens in the next few days when I move onto sewing the top together. I love it. It looks great! Nine patch is one of my favorite. Quick to make and looks great without much effort. I think it’s beautiful. Maybe it’s the darkest block that bothers you. Most are light and bright. Try taking out the darkest one and replacing with a brighter one?? I’m so glad you came! Trust me. . . no amount of awkwardess can scare me! You did great and I can’t wait to see you next month! I really love it – it looks so bright and colourful. I like the fabrics very much – what line did you use for them? Love your nine patch blocks. Colors look great. Now I want to make one! This is BEAUTIFUL!! what wonderful colors. I love it JUST LIKE THIS. Are you going to use white sashing? I’m looking forward to seeing the end result. I know this post is from long ago but I just found your blog today. I love this quilt and I love both of the colors of the sashing that you were considering in another post. I think you just have to decide which look you are most attracted to. I love the scrappiness of this quilt. One thing that might make it look more balanced is if you alternate the lights and darks more regularly. For instance, where you have a block where the darks make up 5 of the 9 squares (the middle square and the four corners), alternate that block with one where the lights make up 5 of the 9 squares. You can mix this up somewhat to get a more interesting effect but overall it might look more balanced if you alternated blocks in this way. Just a suggestion. Don’t worry about how often you post. Do it when you feel it, or not. There are no blogging (or quilting) police! Happy Holidays!